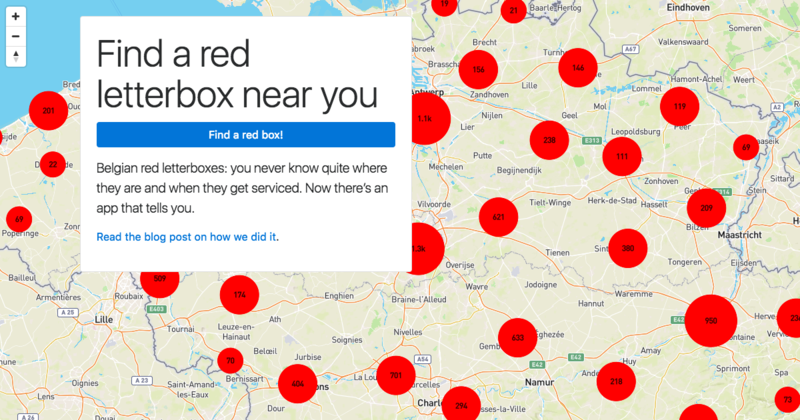 Visit red-boxes.be if you want to find an open letterbox in Belgium. In Belgium, we send letters. Every year though, the market for postal letters decreases by about 5%. Post offices close. Mail boxes disappear. So when we need to send a letter, we might not know exactly where to post it. Throughout Belgium, 13,049 red letter boxes in various designs stand in the streets; yet they are not that easy to spot, and their mail is collected at a different time of the day, anywhere from 8:00 to 19:00.
bpost, the Belgian mail company, has a specific webpage on their website for finding addresses of mail boxes. To use it, you need to know the exact address of your location or enter your postal code, which is slightly easier (Belgian postal codes cover a large area). But from a mobile phone, you can’t reach that part of the form because horizontal scrolling is disabled. Worse, once you’re in the app, it’s not exactly easy to navigate—you might find yourself in the Pacific Ocean when clicking amiss. Eric Schrijver (l) of I like tight pants and mathematics and Luc Rocher (r), Phd student at UCL, at Hack Belgium in Tour & Taxis, Brussels. For Hack Belgium, me and my teammate Luc Rocher decided to tackle this problem. Hack Belgium is the first countrywide hackathon in Belgium. I was happy to run into Luc, whom I first met at a guided tour of the Internet Archive in San Francisco a few months ago. If you look at the website of the hackathon, you’ll notice that the subjects tackled are rather huge. There is a smell of technical solutionism—smart technologists and entrepreneurs will come up with tools that fix societal ills. As the days progressed, we also noticed it is more about coming up with plans, than with doing a hack. It’s fun to think about how to create a product and monetise it. But it’s even more fun to build something right now. The first thing we need to make such an app is the information about the red boxes: where are they, and when are they open. Where do we get this data? The Open Knowledge Foundation has a page listing the availability of these kinds data for a range of countries. In Belgium, various public organisations are involved in open data initiatives. But bpost, which is an ‘autonomous state-owned company’ is not necessarily involved in them. On Twitter, you can find a request from 2012 by Bart Rousseau, asking if there were chances to open up this data. Even if bpost agreed this was their intention for the future, “we unfortunately can not offer this information on a short term”. It has been almost five years since—it’s clear that we need to try another approach to get access to this data set. 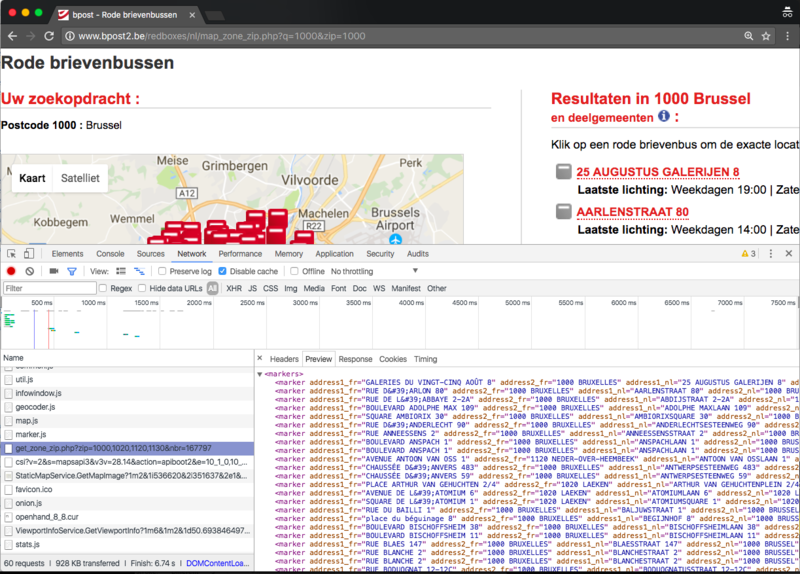 By modifying the last URL by appending every Belgian postal code, we managed to download the location of every 13,049 mail boxes, along with their collection hours during weekdays and weekends. We developed a simple application whose code is already available on Github, using the data set in combination with the Mapbox GL library. Everyone traveling across Belgium can now easily find not only the closest mail box, but also quickly which ones will still be fetched before the end of the day. Want to you use the data yourself? For our app, we converted it to the GeoJSON standard that is easy to build upon. Data like the position of a postbox and its collection hours are not protected by copyright as creative works. But a collection of such data holds database rights. By downloading all this data from bpost and redistributing it, we are probably infringing on their intellectual property. 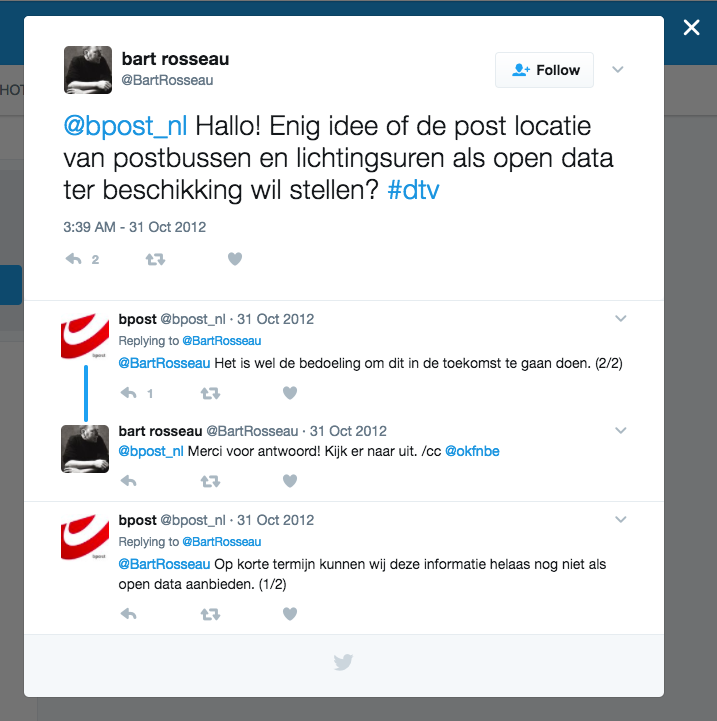 We hope that bpost will make good on their promise and release this data under an open license! By publishing this application, we want to show how every citizen can profit from the opening of public information. Visit red-boxes.be, and let us know what you think in the comment section! Want to thank us? Use our links to subscribe to MUBI for an exquisite pick of independent streaming cinema, and eFarmz for local Belgian food delivered to your door.